Do you ever find a new recipe that you love so much, you just want to make it over and over again? That’s how I feel about this autumn rice pilaf. Although the calendar is just now turning November, we’ve been eating this dish for weeks. 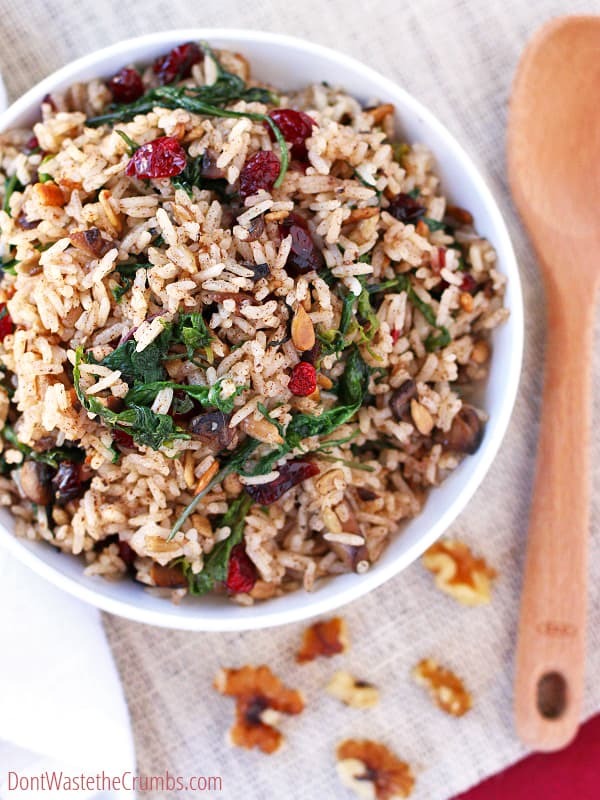 The smell of cinnamon, the tang of cranberry and the lovely, healthy green factor… not to mention that it’s all mixed up in the ever so frugal whole grain rice? Yum! It’s like Thanksgiving in a bowl! We’ve had this dish more times than I have fingers on one hand, I kid you not. Partly to make sure my measurements are right – a true struggle since I rarely measure anything anymore. Then if I do happen to remember to measure, I forget to write it down. And if I happen to remember to write it down, I can’t find the paper I wrote it on. So that accounts for two of the batches. The other three (or more?) were because this dish is easy. And because I already had everything in the pantry. And it’s really, really good! 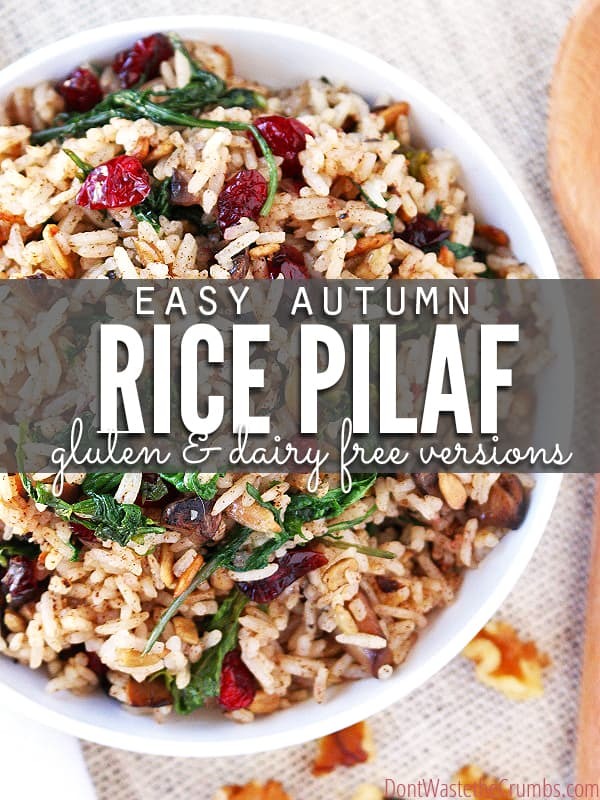 This autumn rice pilaf is inspired by this dish, which first appeared on the October frugal real food meal plan. The original recipe called for barley, but I substituted rice because I didn’t have any barley in the pantry. Lo and behold, the dish turned out pretty good anyway and Mr. Crumbs gave the go-ahead to make it again. So I did! Then it was adding more vegetables, and swapping the pecans out for something a bit more affordable and more likely to be in my pantry year-round earned bonus points. The end result is a gluten-free side dish that would be excellent in place of traditional stuffing at Thanksgiving. One small substitution makes it dairy-free, and another small one makes it vegan. To swing the other way, this would be pretty good with spicy sausage mixed in too! Is it too good to be true? One dish with so many variations? 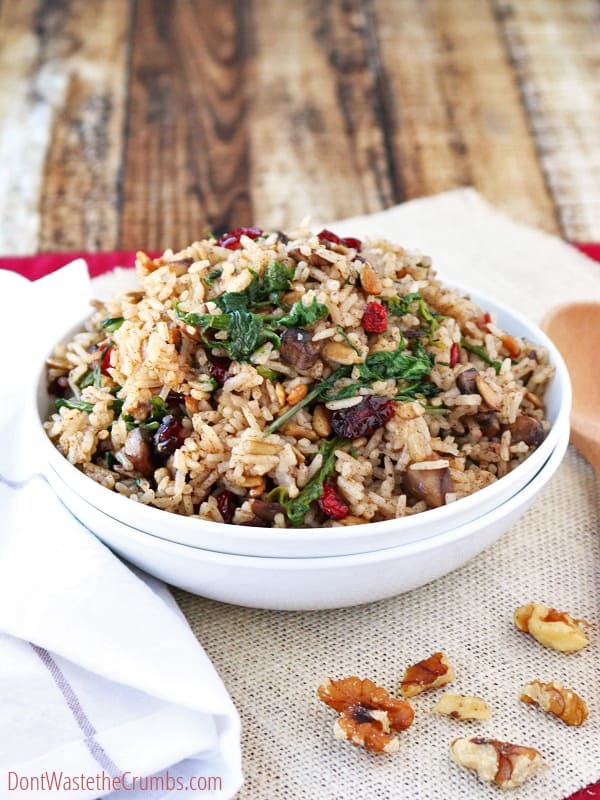 No way my friends, this autumn rice pilaf is really that amazing. Prepare rice according to the directions on the package, substituting chicken stock for water. Meanwhile, melt butter in a large skillet over medium heat. When the butter begins to sizzle (pshhh sound), add the onions and cook for 2 minutes. Add the mushrooms and continue to cook until the onions are nearly translucent. Season with salt & pepper. Add spinach. Stir often to cook, reducing heat if rice is not done yet. Add cinnamon, garlic powder, sunflower seeds and dried cranberries. Stir well. Fold in cooked rice. Take care to stir well, but not to over-stir so rice doesn't become mushy. Taste and season with salt & pepper as needed. Vegetarian Option: Substitute vegetable stock for chicken stock, and replace butter with coconut oil. Dairy-free Option: Substitute butter with coconut oil. Inspired by The Organic Kitchen. The recipe calls for spinach or baby kale, but I did that for those who are new to eating green vegetables. If you’ve more seasoned in the dark leafy green territory, you can easily substitute heartier greens like collards or beet greens. We’ve tried both, and even tried lacinato kale (the super dark, stiff kind), and there were STILL empty dishes without complaints! If you don’t stock dried cranberries in your pantry, raisins would likely make an excellent substitute. Other options for crunch include pepitas (hulled pumpkin seeds), chopped pecans, walnuts or almonds. Use in place of, or in addition to, the sunflower seeds already listed. As written, this recipe serves 4 without much leftover. However, I make 1 1/2 times the recipe to allow ample for dinner plus a few lunches leftover too. Get a full frugal Thanksgiving menu, plus shopping list and detailed prep list (essentially everything to do the whole week leading up to the big day) for free! It’s all included in the Stress-free Guide to Thanksgiving. Click HERE and scroll to the bottom of the post to get your FREE copy today! Do you have favorite rice side dishes? Please share! I’m always looking for more ideas! I will add the extra nuts, seeds & occasionally chicken or bacon and eat as a main. Yes! That sounds so yum!! Yummmmm! I just made this and it is SO good! Of course, my inability to follow directions and the fact that I was missing some ingredients meant I had to substitute some stuff, but still yummy! I used regular white rice instead of jasmine (though I need to get jasmine sometime soon! ), and swiss chard instead of spinach. I totally left the mushrooms out (didn’t have any, not super fond of them). I think next time I’m wanting something sweet, I’m going to just put butter, water, and rice into the rice cooker, then add cranberries and cinnamon when done! So I tend to completely ignore any recipes that include mushrooms since they make my husband sick and I can’t tolerate the texture, but the recipe otherwise looks so good that I’m willing to tailor it – without mushrooms. Is there another ingredient you’d recommend that could take the place of the fungus? Or would it be perfectly adequate just leaving them out? I made it sans mushrooms (because 1) I didn’t have any and 2) I don’t like them) and it was still very, very good! Thanks for chiming in Amber! Rachel – it’s totally find to omit the mushrooms. I added them just to increase the veggie content, and when they’re diced (1/4″) no one in my family notices them. 🙂 Brussels sprouts might be good in this, if they’re par-boiled first and quartered. Otherwise, just enjoy without the mushrooms! Yum! This I think this will be a new favorite. I forgot to cook my rice in chicken broth, so I added a dollop of “better than bouillon” when I was cooking the onions and mushrooms to add a bit of flavor boost. Not as good as homemade broth, which I have a freezer full of lol! Can’t wait to try the leftovers stuffed in acorn squash tomorrow night! I like a high “stuff” ratio too Z. 😉 This is by far one of our favorite “new” recipes. So easy to throw together, plus the substitutions you can make without affecting the overall taste is AWESOME for the fridge! I’ve been eyeing this recipe for a while but my husband isn’t too keen on cinnamon in savory dishes. I came across a Moroccan spice called ras el hanout. It has cinnamon in it but it is more savory. I think that might work! Ooh, I think that would Melissa. Let us know how it turns ut! This was SO GOOD! I left out the mushrooms and used toasted pecans and currents. So fantastic. Loved it. Thanks for the recipe. This is a keeper. So glad you liked it Lily – great substitution ideas too! So so very delicious. I served my rice with Moroccan spiced lamb cutlets and sweet potato. Thanks a bunch! Now added to my faves. Looking up this recipe to make it again! My favorite fall recipe from last year! Amazing!!!! The only thing I did differently was adding chopped spinach instead of adding them as a whole. Soooo good! Thank u for the recipe! Amazing dish, so versitile. I added ground sausage and garnished with scallions. The sweet and savory is over the top delicious!! I’m so glad you liked this Eleanor! Turned out great!!! Thanks for the recipe!